Quiet and beautiful are the two words that you want to come to mind when you’re looking for a date night restaurant. Rachel and I try to have a date night a couple times a month, and we usually have an idea of where we want to go. This time, the place we had in mind was packed and noisy – not an ideal date night. After walking away, we sat in the car for a few minutes trying to think of somewhere else we could go that we could get in without too much of a wait. Rachel thought of Fabi + Rosi, which I’d never heard of despite the fact that it’s been in austin for almost a decade. Well, quiet and beautiful says it all for this cozy little West Austin neighborhood restaurant just off Lake Austin Blvd. Here are the dishes we ordered – click on the picture to see the slide show. Sustainable Right off, Fabi + Rosi hits an important note with us in how careful they are in sourcing their ingredients. It has taken many years, but Austin is finally developing a food culture that values the quality and sustainability of high quality local ingredients. Fabi + Rosi pay attention to sustainability in sourcing their meats and produce as locally as possible including raising vegetables and chickens in the backyard of the restaurant. Next time we go, I want to go back and see the garden. Fabi +Rosi describe their fare as “classic European dishes with a modern twist.” The menu has a nice mix of dishes and changes seasonally as ingredients come and go. As usual, we had a mix of appetizers and main dishes. We ordered the Mixed Beet Carpaccio, The P.E.I. 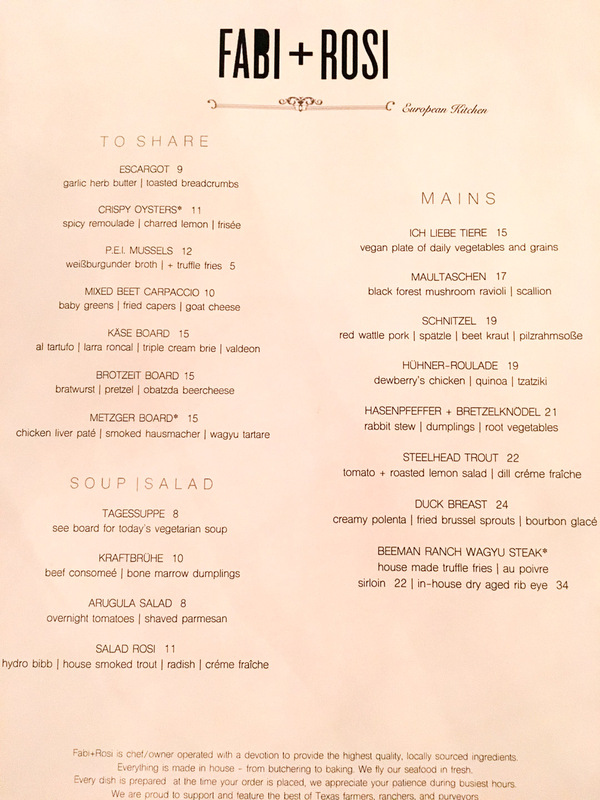 Mussels, the Maultaschen – a wild mushroom ravioli, and a glass of Grüner Veltliner. All three dishes were excellent. This isn’t haute cuisine, but it is very well done, delicious food. The beet salad and the ravioli were interesting and creative. The mussels were delicious, but no different than the same dish at a half dozen other restaurants in Austin. A good standard – make sure to get extra of their home baked bread to dip in the leftover sauce. 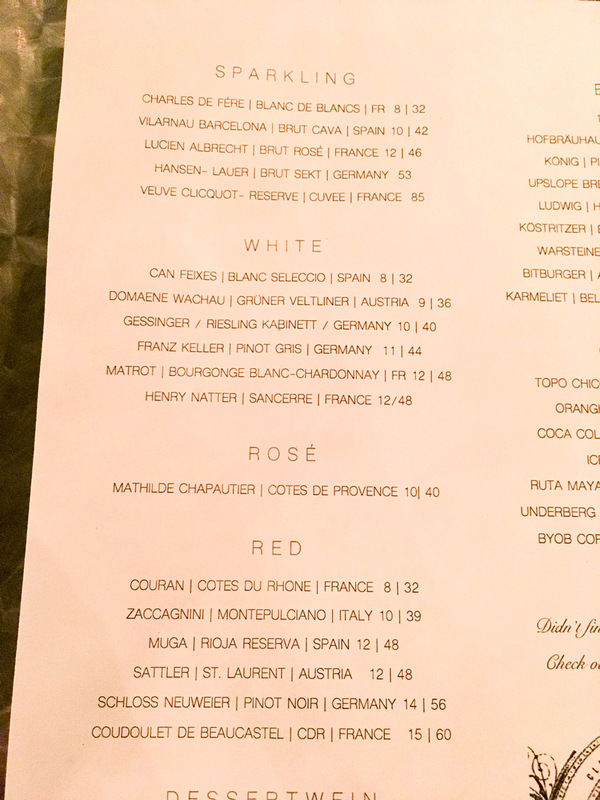 I always like to say something about the wine menu of restaurants. We went to Fabi + Rosi again with friends after our date night, and three of us had a glass of wine. Their wines are well chosen, but they are not at the top of my list for excellent wine list restaurants. I tried a couple of the reds, which I thought were just okay before deciding on one for dinner. The best wine we had was the Lucien Albrecht Brut Rose. We also like the Grüner Veltliner, an excellent Austrian white that is dry and slightly floral. It was perfect with the ravioli. Yum. The upshot Fabi + Rosi is a great romantic date night restaurant. Perhaps one of the best in Austin, because of the quiet cozy atmosphere. There are plenty of very good noisy, bustling restaurants in town. Uchi has great food, but don’t expect to carry on a conversation. The food is excellent, moderately priced, and high quality. And if sustainability is important to you, this should be one of your go-to restaurants.